It's safe to say the Buffalo Bisons' offensive slump, brief as it was, is over. The Herd hit the ball all over Coca-Cola field Sunday afternoon, pounding 14 hits in an 11-6 win over the Charlotte Knights. It was a balanced attack, as seven Bisons recorded a hit en route to matching the Knights' win of an identical score in the first game of a four-game set Saturday night. Buffalo had just eight total hits and seven runs in its two games prior to Sunday's matinee, which was decided by Ryan Langerhans' game-winning solo home run that broke a 6-6 tie in the fifth. Having a mental plan when going up to the plate is what manager Marty Brown has preached to his club all year. And nearly doubling the offensive output from the two previous games, the execution of that met Brown's approval. "Everybody has a better plan," Brown said. "We had discussions about how to approach these situations, and a lot of it is mental more than it is physical. It was a good day." A day after going 2 of 12 with runners in scoring position, the Bisons were locked in when base-runners were on the cusp of scoring, going 7 for 15 in those situations. Now, the key is to stick with the mental aspects of hitting that glowed so brightly Sunday. "It's just a consistent plan," Brown said. "(Pitching) is a way to be able to sometimes mentally trick your mind and your body to do things that's unnatural. It's just having a better plan, thinking it through before you go up there and then you'll have a better shot." The top of the Herd's lineup did a good portion of the work. The 1-4 hitters, Anthony Gose, Jim Negrych, Moises Sierra and Luis Jimenez combined to go 9 for 17, scored eight runs and drove in six. Sierra especially exhibited what the strived-for end product of the plan is. He had three hits and an RBI to increase his average to .326. "He's a very talented player and really brings a lot to the table in all aspects," Brown said of Sierra. "The thing is a maturity thing, where he's consistent with his playing, as well, and he knows there's a proper way to play the game. He's trying to just mature his game, that's all. He has the ability right now to be in the big leagues. But it's about being consistent with his game plan every day." Opposite a potent offense, the Bisons' starting pitching continued to struggle. Todd Redmond, making his initial start of 2013 after missing the first 41 games with a shoulder injury, lasted just 3 1/3 innings on 78 pitches, and allowed six hits and five runs, all earned. The top of the Knights' order presented the most problems for Redmond. Three straight doubles in the third by the 1-2-3 hitters gave Charlotte two runs and a 3-0 edge. Leadoff man Blake Tekotte had the first double, and he crushed a three-run homer for an encore the next inning off Redmond's relief, Chad Beck. Not to be outdone, the Bisons' first four batters did substantial damage to Knights' starter Zach Stewart. In the bottom half of the third, they all had successive singles and eventually scored to give the Herd its first lead, 4-3. Gose got the big frame going with a bunt single down the first-base line. Negrych followed with his second base knock of the afternoon. Sierra and Jimenez's hits brought in the top two guys in the lineup, while a Mauro Gomez groundout plated Sierra, and Josh Thole's single to right brought in Jimenez. It was more of the same in the fourth. Tekotte's three-run blast in the top half was answered with two-out RBI singles by Negrych and Jimenez to nod the score at six. Playing in a game for the first time since opening day in which his average was below .400, Negrych went 3 for 5 with two RBIs and three runs to raise his average from .390 to .398. 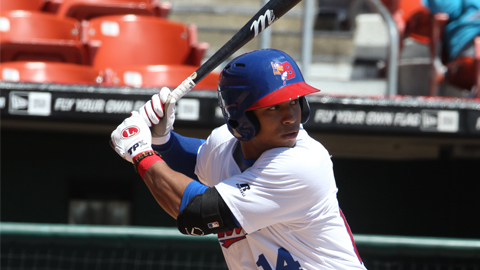 Jimenez led the team with three RBIs to increase his season total to 42, which leads the international league. After Redmond departed, the bullpen pitched 5 2/3 stellar innings to close the book. Beck picked up the win in 1 2/3 innings of work, allowing just one run on two hits. John Stilson, Juan Perez and Neil Wagner combined to no-hit the Knights over the last four innings, striking out six in the process. With the Bisons starters' ERA around 6.00, the bullpen has done its part recently to keep the team in games. "They've all come to the ballpark ready to pitch, taking the ball, and I think it's given us an opportunity to shut down some offenses late in the game and give us a chance," Brown said. BISONS NOTES: Gose scored two runs, giving him an IL leading 36…The Herd improved its record to 16-0 when leading after six innings…Sierra registered three or more hits for the third time of the season…Negrych's three-hit performance was his 16th multi-hit game…Langerhans roundtripper was his eighth…During the game, the Toronto Blue Jays claimed Thad Weber off waivers from San Diego. The Jays then assigned him to the Bisons. The 28-year-old right-hander started six games for Triple-A Tucson and has three relief appearances with the Padres…A good crowd was on hand, as 8,720 was the announced attendance.